Jonathan Freedland argues that, despite what American Jews may think, European Jewry is not living in a new dark age. Forgive all the detail, but this is becoming a regular task for a British Jew: reassuring our American friends that, no, we are not living in a new dark age and, no, the lights are not going out all over Europe. We are getting used to the fact that U.S. Jews seem ready to believe the worst of this part of the world. In the two cases I've mentioned, many Americans were all too willing to accept that British Jews were about to become latter-day Marranos, driven underground by an anti-Semitic government and its jihadist allies, huddling together to teach their children about the Holocaust in Hebrew whispers. You'd be surprised how often my fellow British Jews are required to disabuse U.S. friends of such delusions. One leading communal professional recalls a London meeting with an American counterpart, the latter first insisting on a tearful embrace: “You’re going through what my grandmother went through in Russia, with the pogroms,” he sniffed. Another asked if a Jew like him would be safe walking through the streets of London. Such fear is fed by emails spreading bogus scare stories, but also by the claim that the British capital has become Londonistan, a sharia-ruled outpost where al Qaeda sheiks preach on every street corner, and by the breathless description of London as “the hub of hubs” when it comes to “delegitimization” of Israel. In this conception, the calendar might say 2013 but the year is forever 1938, with the Jews of Europe on the verge of another catastrophe—and once again too blind to see it coming. So are those sounding the warning guilty of hysteria? Or are those who dismiss it guilty of a terrible naiveté? The clearest answer can be found in that most Jewish of practices: the drawing of distinctions. Beneath these two headline cases are a hundred other lesser points of friction, often on campus, situations where Jews and Muslims have clashed, frequently over the politics of the Middle East. A consistent trend, noticed by those who monitor anti-Semitism, is a surge in anti-Jewish hatred whenever the conflict between Israelis and Palestinians escalates. Leave Western Europe, to head east or more recently south, and the picture alters. Here the threat to Jews is of a much more familiar variety. The far right, white and bellicose, has surfaced with a vengeance especially in those former communist nations where ultra-nationalism was once repressed. Witness the rise of Jobbik, a Hungarian neo-fascist party that is the country’s third largest. One Jobbik M.P. recently called for all of Hungary’s Jews to be registered on a list, as a threat to “national security.” The resonance of a list of Jewish names in Hungary, where 500,000 Jews were rounded up and murdered during the Nazi period, hardly needs to be spelled out. In Greece, the Golden Dawn party concentrates its fire on the Asian and African immigrants whom it blames for the country's economic woes. But like so many rightists of the old school, when it comes to Jews, Golden Dawn can’t help themselves. According to the Jewish Telegraphic Agency, “Golden Dawn’s leader, Nikolaos Michaloliakos, denies there were gas chambers or ovens at Nazi death camps and has a penchant for giving the Nazi salute.” The party spokesman recently rose in Parliament to read out a passage from the Protocols of the Elders of Zion. But here's where distinctions matter. The Greek fascists speak of Israel as a “Zionist terror state,” but that sets them apart from many of their comrades on the European far right, who have become late converts to the cause of Israel—chiefly, it seems, as a way of confronting Muslims. The British National Party leader Nick Griffin is fond of boasting that his was the only party that supported Israel during Operation Cast Lead in 2008–9, while activists in the rival English Defence League have grown oddly fond of the Israeli flag. Tellingly, this habit can lead many of those U.S. doom-mongers, constantly warning of European Jewry's dire plight, to be rather selective about which threats they see. While they can be relied upon to highlight any Islamist clash with Jews, they often stay hushed about those ultra-rightists who have no love for the Jews but who, for their own reasons, have decided to declare themselves pro-Israel. So there was no email circular about Michal Kaminski of the Polish Law and Order party, even though Kaminski began his career in the National Rebirth of Poland movement, inspired by a 1930s fascist ideology that dreamed of a racially pure nation, and even though in 2001 Kaminski upbraided the president for daring to apologize for a 1941 pogrom in the town of Jedwabne that left hundreds of Jews dead. (Kaminski said there was nothing to apologize for—at least not until Jews apologized for the suffering they had inflicted on the Poles.) Presumably the email circulators hesitated to condemn the Polish politician because he had branded himself as pro-Israel. Similarly, Marine Le Pen, leader of the Front National, found very few ambassadors willing to meet her when she paid a 2011 visit to the United Nations in New York—save for Israel's then U.N. envoy, Ron Prosor, who later had to apologize for giving the impression that he was happy to turn a blind eye to Mme. Le Pen's record because she had made the right noises on Israel. For some, it seems, anti-Semitism is only worthy of strenuous opposition when it is combined with hostility to Israel or comes from a Muslim source. Which brings us to another crucial distinction. Episodes that Americans see as evidence of growing European hostility to Jews are often understood by European Jews to be criticism of Israel—in fact, not even criticism of Israel itself, but rather of a specific strain of Israeli policy: what we might call the Greater Israel project of continuing and expanding settlement of the West Bank. When European governments either abstained or voted for the Palestinian upgrade to semi-statehood at the U.N. in November, plenty in Israel and the U.S. saw that as yet another example of age-old European hostility to the Jews. But very few Jews here saw it the same way. We understood it for what it was, an attempt by governments avowedly sympathetic to Israel's right to security to revive the two-state solution for the Israeli-Palestinian conflict. Their calculation might have been wrong, but it was not anti-Semitic. Yet one regular on the academic anti-Semitism studies circuit tells me that U.S. speakers repeatedly cite examples of anti-Israel discourse as if they were synonymous with instances of anti-Jewish racism. A scholar in his own right, he is infuriated that his colleagues fail to make this critical distinction. Above all, those stubbornly committed to the view of twenty-first century Europe as one large Auschwitz-in-waiting have a one-eyed view of Jewish life on this side of the Atlantic. They rightly report the chilling news of an apparent ban on religious circumcision in Germany or the move to outlaw shechita, the ritual slaughter required to produce kosher meat, in Poland—but fail to report when those decisions, initially taken at a lower level, are swiftly overturned. More importantly, they fail to notice the intriguing paradox of European Jews' current position—that there are dangers, but also great triumphs. Take Britain. Jews here can feel unease at the tenor of the national conversation on Israel—a newspaper cartoon here, a politician's turn of phrase there—but they also enjoy a Jewish life that is in many ways richer than ever before. Limmud, the annual festival of Jewish learning that has gone global, began here, while Jewish Book Week has become London's biggest literary festival. The Booker Prize for 2011 was won by a novel about Jews, The Finkler Question, written by a man who has chronicled the British-Jewish sensibility better than anyone, Howard Jacobson. British TV currently airs not one but two highly rated sitcoms depicting Jewish family life. Meanwhile, if the current polls hold till 2015, Britain's next prime minister is set to be the first Jewish leader of the Labour Party, Ed Miliband—who repeatedly stresses the pride he takes in his Jewish roots. Not bad for a Jewish community that, according to the latest census, numbers just over 260,000, less than 0.5 percent of the British population. This is why the Community Security Trust, which monitors anti-Jewish racism, opens its report with an insistence that “British Jewry should be defined by its success and vibrancy rather than by anti-Semitism.” That is true of Britain but also beyond. 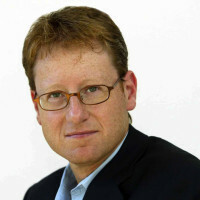 Mark Gardner, director of communications for the CST, used to compare the European-Jewish situation to a glass that some will see as half full, others as half empty. Now he says, “There are two glasses, one half full, one half empty, and they stand side by side.” That sounds sufficiently nuanced to be correct. But don't expect anyone to be putting that message in an email.